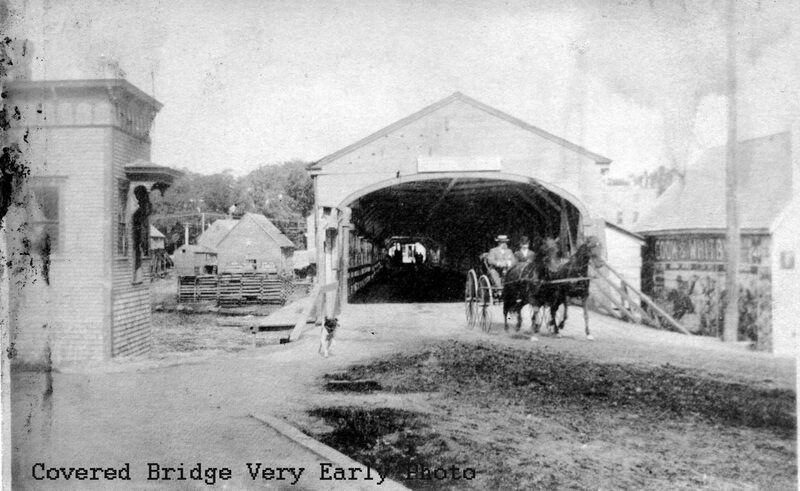 Covered bridges, like the old bridge from St. Stephen to Calais pictured above, have long since passed into history. Not that there aren’t any covered bridges left in the country but those that remain are valuable historical treasures and most have been restored to such a beautiful condition that the original builders would hardly recognize them. They are preserved by state “Covered Bridge” societies and the National Society for the Preservation of Covered Bridges which will sell you, by the way, calendars and publications of all sorts related to covered bridges including a World Guide to Covered Bridges. Naturally there are innumerable covered bridges bus tours. When we see one we say, “How unique” or “picturesque.” But the fellows who built those bridges were hard-headed cusses and they did not build them to be “unique” or “picturesque”, but to last. 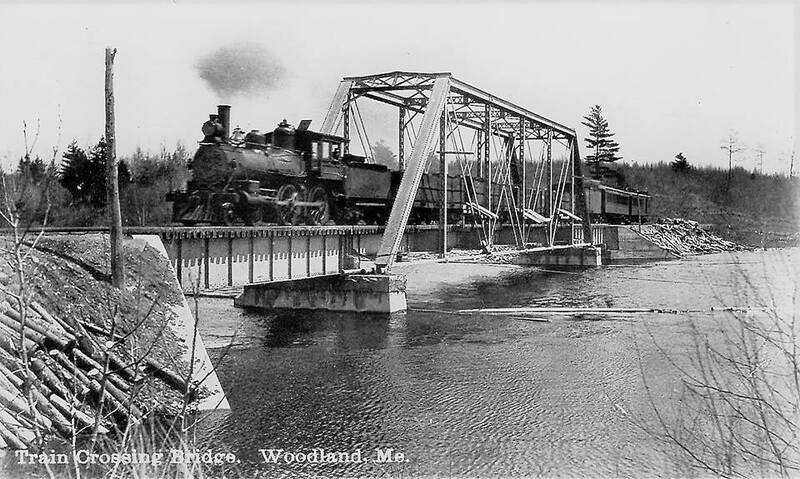 The heavy trusses and timbers of the bridge stuck up into the air and were exposed to all wet weather, and they put a roof and sides on to keep dry and make them last longer. 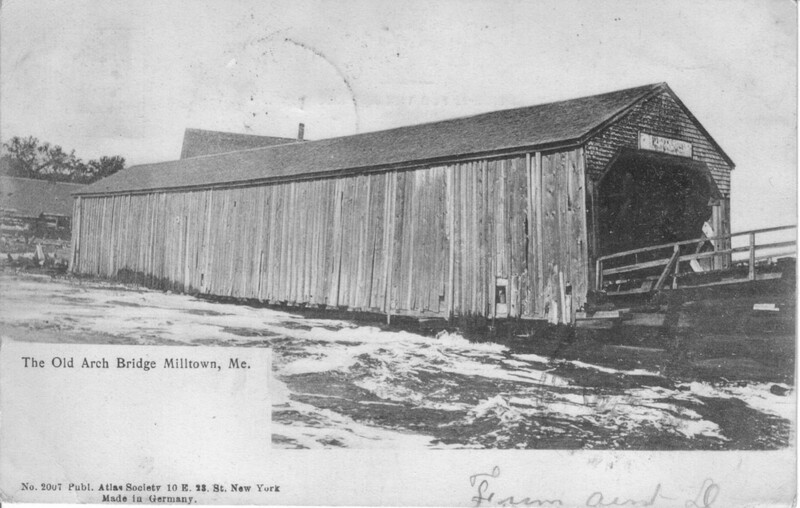 Ned Lamb also make an important historical point in his article- in all the wide world there were but five international covered bridges, two in Switzerland and the other three across our own St. Croix River. Let’s take a look at them. We’ll start with the old arch bridge in Milltown. It didn’t look like much because it wasn’t. It connected the mills on the U.S. side with the mills on the Canadian side just above the old Cotton Mill. 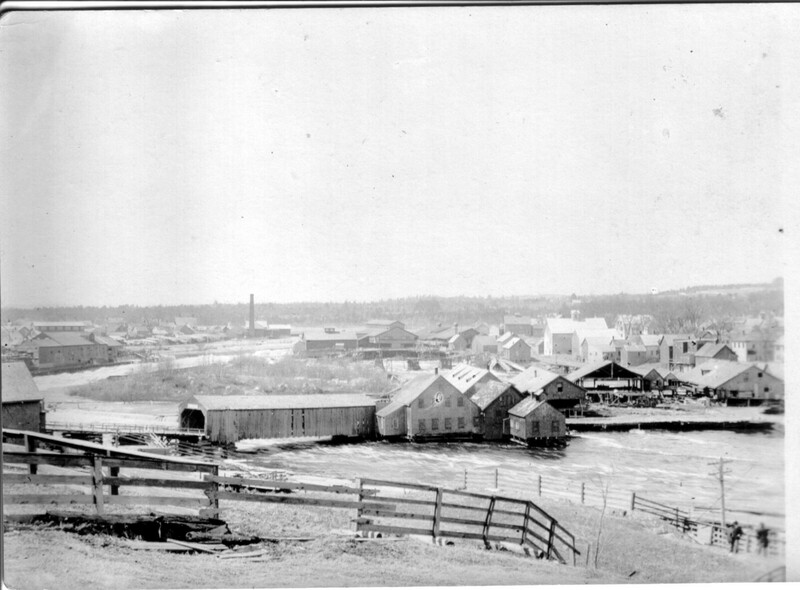 The buildings in the second photo are mills built over the river and are mostly on the Canadian side. To the right in the photo is Milltown New Brunswick. The photo was taken on the U.S. side at Knight’s Corner. The arch bridge allowed easy access back and forth across the river for Cotton Mill workers and smugglers of lumber, booze, kerosene, tobacco etc. Whatever was substantially cheaper on one side of the river flowed across the old Arch bridge to the other side, usually the traffic was two way. It washed away in the great flood of 1923. The most conspicuous man at that time to my mind was Mr. Andrew McCullough, as he seemed empowered to regulate the movement of all the people, or rather to make people pay for going where they pleased. At the time I men­tion both ends of the bridge at Ferry Point were well guarded; at the Calais end by Mr. McCullough, who, with his ominous cry of “toll” to impecunious individuals, or those who tried to pass the toll-house without paying, was looked upon as a tyrant ; and at the St. Stephen end was a one-eyed man named Welsh, a custom’s officer or tide-waiter. Mr. Welsh was the most cordially hated man for years on the St. Croix. He seem­ed to watch at the end of the bridge night and day. Schemes used to be devised to evade his vigilance while he was eating or sleeping, but he would appear on the scene of action at such uncertain and erratic times, that it was almost impossible to avoid him; and be would disarm women, children and men, crossing from the Calais side, of the smallest parcels, with a sternness and air of authority which would almost lead to the belief that the whole weight of the support of the British Crown rested on his shoulders. The Custom’s seizures on the Calais side were few, and only in cases of flagrant violations of the revenue laws. 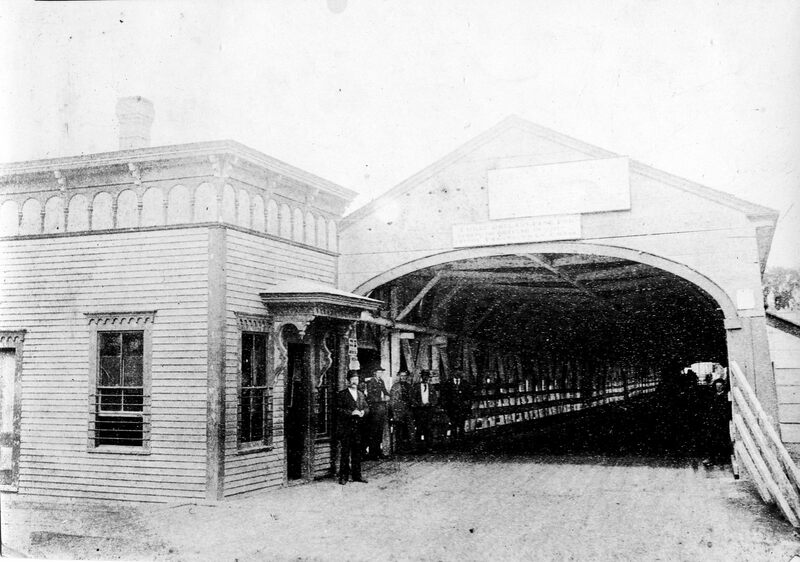 This bridge was replaced in 1894 by a steel bridge designed to bear the weight of the new streetcars. The second photo above also shows the Ferry Point covered bridge. The photo was probably taken from the top of Whitney Street or perhaps from the corner of Union and High streets in Calais. The “cove” just above the bridge is in the foreground and the St. Stephen end of the bridge is to the left. Just why he did it we do not know. He may have thought he was smart, he may have had some spite against the railroad, he may have been just “cussed”, but a certain man set fire, and burned the bridge at Sprague’s’ Falls. He must have done it at night because the smoke was not noticed in the morning. The next morning the train left Calais about 7:30 behind the Princeton engine. The set was as follows: Conductor, Charles MacDonald; Engineer, Wallace Haycock; Fireman, John McCurdy; Brakeman, Billie Burton. The place where the bridge wasn’t was noticed in time for the engineer and fireman to jump, but not in time to keep engine from going into the hole and dragging the tender after her. The old engine carried a big dent in her boiler all the rest of her days. Who was the man? We might tell you, but perhaps it is just as well to let the name rest in the limbo of forgotten things. Anyway he served a term of two years in Thomaston for his little bonfire. He rode over the road years later, but perhaps he was too drunk to remember the fire. There had been an excursion to Princeton and one man celebrated entirely too much, and they had to arrest him and put the cuffs on to handle him. He was put into the smoking car to go to Calais. When the train got over the bridge and into Canada, some of his friends pulled the car coupling and stopped the train, and then demanded that the officer take the cuffs off and let him go as he was then on Canadian soil. That had to be done, and the man walked the rest of the way, probably with some of his friends to steer him straight. Life can be complicated along the St. Croix. 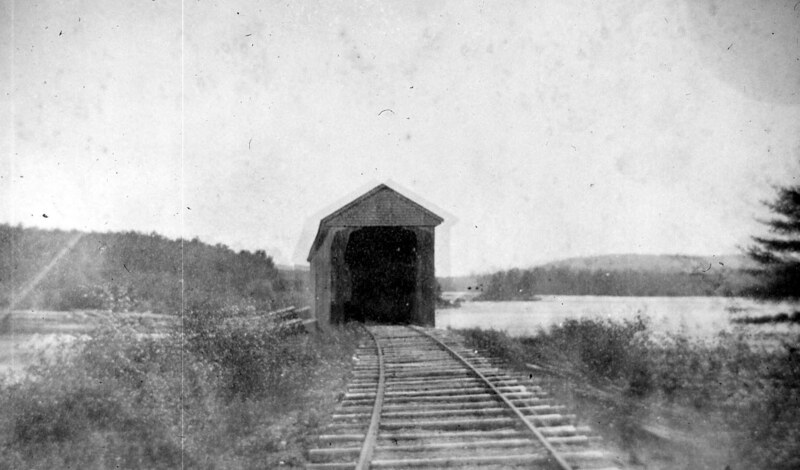 The covered bridge was replaced by the bridge pictured in the second photo above. It is still there if you want to make an excursion to Woodland and take a short walk along the tracks.